Wondering how to get free money fast? Believe it or not, you can turn the hours you spend online doing what you already do into free cash. You can make easy money by watching videos, searching the web, answering surveys, shopping online and more. There are many companies out there that will help you make money fast today in your spare time and with minimal effort. Some companies give away free money and gift cards as a way to promote their products or websites. While others reward you in form of points or cash back for performing certain actions. 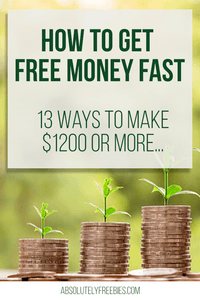 In this post, I’m sharing the best ways to get free money online. You could make thousands of free cash right now with very little effort. How to get free money fast right now? Each program on the list is 100% free to sign-up. They are a handful of best free money offers, money-saving apps and services that offer bonuses just for signing up. The value extends beyond the sign-up bonuses offer though as you’ll soon find out. Registering with any of them is a smart way to make money while waiting in queues or an endless daily commute! Without further ado, here are a few ways to make quick bucks today. Online surveys are becoming more common practice for marketing and social research. In fact, Internet surveys research accounted for 20% of global data-collection expenditure in 2006. Fast forward today, more and more companies are willing to reward survey participants for sharing their opinions. This means more opportunities for people like you and me to get free money online! While you won’t get rich instantly by taking surveys today, this free and easy money could add up quite substantially if done correctly. Here are a few companies that pay for your opinion. VIP Voice rewards you with points for sharing your opinion and services. With their tiered rewards program, the more surveys you take the more points you earn. The only problem is that you can’t convert these points directly into cash or gift cards. You can use these points in sweepstakes and auctions. Prizes include cash prizes, gift cards and vacations. The site claims that thousands of prizes are awarded each month. MySurvey is an online paid surveys company that pay people for taking online surveys and testing products. They have been conducting online surveys since 2001 and in 2014 alone, MySurvey awarded over $32 million to their members. You can redeem your rewards for a high variety of products including home and personal care items, as well as PayPal cash, Amazon gift cards, vouchers and more. This is a unique opportunity where they pay you guaranteed monthly incentives – up to $15 per month ($5 per device type) and up to $180 in a year, simply for remaining active in the SavvyConnect community. Established in 1975 in France, Ipsos offers many good and high paying offers if you match their target group. Most surveys take less than 10 minutes to complete. Ipsos is also popular because you get frequent invites. You’ll earn i-Say points which can be redeemed for rewards like PayPal Funds, Visa Prepaid Cards, Amazon.com gift cards and iTunes Gift Certificates, even donations to charity. After completing a survey, you also enter into a prize drawing like tropical cruises or bonus points. With InboxDollars, you’ll participate in online activities such as taking surveys, reading emails, watching videos or shopping online. In return, they will reward you in real cash for your time and participation. Easy right? To join, you must be at least 18 years old and are living in the United States. If you participate in the reading emails program, I suggest signing up using a secondary email as this will help you separate your personal email account from their promotional emails. Regardless of whether or not you take advantage of the offers in the emails, you will earn cash just for confirming the PaidEmail participation. Joining is free and they’ll even credit your account $5.00 just for trying their service. They claim to offer the latest and highest paying research product test, focus groups, clinical trials and survey opportunities. SurveyClub pays as high as $115 for a 30 minutes survey. Anyone 13 years or older from the US, Canada, UK and Australia can participate in their online surveys and earn free cash, free products, points, gift cards, and prizes. You can receive new surveys and opportunities to make money via email or text message. As a participant, you have access to hundreds of local research opportunity in your city too. Simply join the paid surveys and focus groups listed on SurveyClub and share your opinion with a wide range of companies on a wide variety of topics. Vindale Research is another of those get paid to take surveys companies. The main difference is that they pay you in cash, not points or gift cards. They have fresh surveys daily and you can take as few or as many as you wish. You could earn up to $75 for each survey taken. Most surveys from Vindale are related to current events and trends, something that you probably are interested to answer. With Swagbucks, you earn free gift cards and cash for the everyday things you already do online. Swagbucks gives your $5 just for signing up. Beyond that bonus, you can earn gift cards to cover your next holiday gift purchases How cool is that? You earn points by shopping online, watching videos, searching the web, answering surveys and finding great deals. Whether it’s retailers like Amazon, Target, Wal-Mart or converting bonus points to PayPal cash, Swagbucks gives out over 7000 free gift card each day and help you earn money in your spare time. This offer is available in Australia, Canada, Ireland, United Kingdom, United States. OneOpinion conducts surveys on behalf of leading market research companies. Their surveys are a fun way to learn about new products and services and to help influence their development – all while earning great rewards, like gift cards from VISA. Get Paid to Share Your Opinions with MakeSurveyMoney, plus, get a $5 signup bonus. From traditional surveys from companies to daily surveys and cash for trying out free offers. Perhaps you are looking to get easy PayPal money for free. Look no further than Survey Junkie if you want to get payouts sent directly to your PayPal account. To join, you must be 13 years or older and reside in the United States, Canada and Australia. Survey Junkie awards you virtual points which can be converted into cash. The rewards for each survey will vary but with commitment and consistency, earning free extra cash each month is possible. Their rewards program offers popular gift cards from Amazon, Target, etc or cash outs via PayPal. Start by building your profile and Survey Junkie will match you to surveys. To earn extra points, you can even refer friends to participate. If shopping online is what you are already doing, then might as well get paid for doing it right? When it comes to saving money, the following are some of the programs that offer savings, discount and cash back. Ebates lets you earn cash back on Internet purchases. It is available internationally but if you are not from the US or Canada, there may be limited stores you can buy from due to shipping restriction or cost. As a member, you can enjoy up to 40% off in the form of cash back at over 2000 stores. This is possible because Ebates can send thousands of customers like you and me to a store and earns a commission. They then share that commission with you instead of keeping it for themselves. You can opt to get paid via PayPal or mailed check. In addition, you can get a bonus by referring your friends to shop with Ebates too. When your friend join and spend at least $25, you’ll get $25 and they’ll get $10. With a generous $10 sign-up bonus and an ever-growing list of stores, Ebates is one of the easiest ways to save money on purchases you already make. If you’ve been searching for online coupons to get the best deal, search no more. Just join Honey and get the best coupon automatically applies for you at checkout. All you have to do is install the free Honey browser extension and shop like you normally would. Honey works in the background and finds working coupon codes and best deals online. The best coupon code is automatically applied to your cart giving you instant savings. Currently Honey supports over 30,000 shopping sites in the US, Canada, Australia, UK and several others. If you are a frequently Amazon.com US shopper, you’ll love Honey as they will find the best prices on Amazon too. Also, you’ll also earn $5 for each friend that you refer. Paribus is a shopping app that tracks if stores owe you a refund. Currently, they track 25+ major retailers including Amazon, Walmart, Macy’s and Nordstrom. They also monitor hotel room rates booked through Expedia, Booking.com, Priceline, Hilton etc. Shop and plan your vacation online as you normally would. When they detect potential savings such as retail price drops, late deliveries and hotel price drops, they’ll let you know and help you get free refund on the price difference. Paribus is free and easy to join. Just sign up using the email provider where you receive online shopping receipts and they will do that hard work for you. Ibotta works by helping people earn real cash on everyday purchases. If you want to get paid for doing weekly grocery shopping and/or just about anywhere you’d do any kind of shopping, you should sign-up for Ibotta. Ibotta partners with retailers to offer staples on your shopping list, products and brands at discounted prices which they pay you back in cash (not in virtual points or credits). As a member, you’ll be able to use their free mobile app and get cash rebates right from your phone. It’s the best money-saving app for grocery shopping and even on the big brands. Buy products – buy the products at any participating store and keep your receipt. Redeem – take a photo of your receipt. The app will match the products you bought to the offers you selected and give you the cash. Get cash – your cash back will be deposited into your Ibotta account within 48 hours. You can even earn additional rewards and bonuses for referring friends and building your own team. Can you actually get free money for investing? Yupe! No longer this activity is restricted to a wealthy few. Below are some of the simple savings and investment app that you can install to help you invest your spare change without even thinking about it. Do you have spare change lying around or extra cash as you go about your day but didn’t do anything about it? Acorns helps you invest those without you really thinking about it even when you think you don’t have enough money to start investing! Their saving and investment mobile app rounds your credit or debit card purchases up to the nearest dollars and invests the digital change. Just sit back and let your money grow over time. Once your roundups reach $5, it will be transferred from your bank to your Acorns account. Then you can invest in diversified portfolios created by Acorns experts. The best thing is, the whole process is automated. Credit card companies often offer sign-up bonuses to incentivize people to choose their credit cards over others. With so many competitors out there, every company is trying to offer the best sign-up bonus. The benefits can go further than the first sign-up bonuses though. To take full advantage of this you should have excellent credit ratings and pay off your card in full each month to avoid paying interest. Debitize helps you use your credit card just like a debit card. Now your credit card is Debitized, just use it to make purchases as you normally would. Debitize withdraws the exact amount from your bank account and pays off the balance of your credit card. That’s how to get free money fast. We work hard for our money so finding new ways to make extra money with minimal effort is always great. Granted, like most good money making opportunities out there, they won’t make you rich overnight. They do still require some time and minimal effort on your part. If you take advantage of all the programs in the list, you’ve just put free money into your pocket. That’s money that you wouldn’t have otherwise had!